I read this article and wanted to share it with you: 7 Q&As for Homeschooling the Advanced Reader https://blog.sonlight.com/homeschooling-advanced-reader.html. Some children are advanced readers who excel at reading. Either they read naturally without a lot of instruction, or they learn it effortlessly after a few lessons and quickly zoom way ahead of grade level. If you have an advanced reader like this, you may be surprised by the lack of information about homeschooling kids in this camp. There's lots of information on how to teach children who struggle with reading, but advanced readers don't get much attention even though they have unique needs, too! 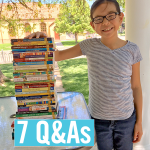 Here are seven questions that homeschooling parents of advanced readers tend to ask along with my own answers based on experiences with my children. Q. Do I Have to Teach Reading if They’re Reading Already? If your child is reading at a 4th to 5th grade reading level at age 5, you might not need to teach reading per se, but many early, advanced readers still benefit from introducing at least some phonics lessons. If your child breezes through reading lessons, seems to have a great grasp of phonics, and doesn't need help spelling, chances are you can skip those lessons. But if your child seems to need a little extra help in those areas, it’s worth going over the rules. Q. Why Can’t My Child Write Well if They’re Already Reading Well? While reading and writing are related skills, advanced readers aren't automatically great writers. Reading is decoding. It’s like being able to translate a message sent in secret code. Writing, however, is different. It’s like trying to figuring out how to translate your own message into a code. It’s much more complicated and requires more mental work than reading does. Most children learn to read well before they learn to write well. Q. Should I Choose Sonlight’s Language Arts Program Based on My Child’s Reading Level or Writing Level? Gifted readers don’t need a lot of reading instruction or practice, but they often still need help writing, spelling, and understanding grammar. 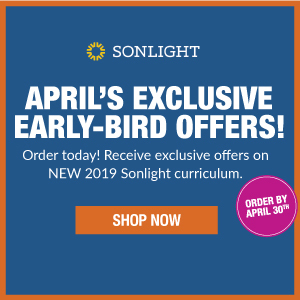 Sonlight allows you to build your own program, mixing and matching reading and language arts levels, but you will want to choose your language arts based upon your child’s writing levels. 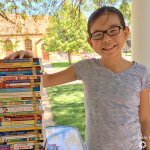 It’s always easier to add extra or more challenging books to your child's stack of Readers than it is to make a complete language arts level less difficult. Download the free samples and use the assessments to see where your child falls in writing. If you have doubts, reach out to an Advisor who can help you find the best fit. Q. What Do I Do if I Run Out of Reading Levels for My Child? Sonlight offers a variety of reading levels for programs before History / Bible / Literature (HBL) D. However, starting with HBL D, your child should ideally be able to use the D Readers and Language Arts D because a lot of the history is found in the Readers. Using a different Reader level at that point can be done, but it does take away from the comprehensive nature of the program. But many advanced readers are also avid readers, reading more than the required readers would have asked for anyway. These children don’t really need to have scheduled readers to encourage them to read every day or need graded readers to help them advance in ability. They will be fine with 20 minutes (or more) a day of free reading time. Q. 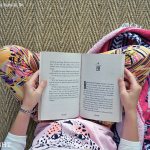 What if My Child Always Wants to Read Ahead? There’s more than one correct answer to this question! Some parents restrict their children to reading only what’s on the schedule for schoolwork while allowing them to read as much as they want in their recreational reading. Other parents allow their children to read any readers at any time, knowing they will be able to relate back to the books as needed. Still other parents will have the child start the book when the schedule calls for it, but allow the child to finish the book early, and read something else until the next book is scheduled. Q. 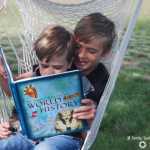 Can I Give My Child Some of the History Books and Read-Alouds to Read (in Addition to the Readers)? Read-Alouds and History. 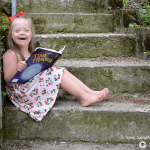 Some children will struggle with these books without a parent to work through these books with them, and find the content too deep for them on their own. You will want to carefully consider each book before giving it to your child, and might even want to read them ahead of time to be aware of the sensitive content and issues so you can address them. You’ll also find many of the books have considerably harder vocabulary, and are longer, with a smaller font, making the reading load much heavier than just adding books at your child's reading level. Your children might get overwhelmed with the amount of reading or miss part of the content because they don’t have a full grasp of what they are reading. So, while you can hand the books to your children to supplement their reading, I would advise you do so with caution. It’s easier for the parent, especially busy parents like myself, who have a lot of children and not a lot of hours to teach in, to just hand a book to a child to read, but it might not always be best for the children. Some children will handle some of these extra books well, but not all. Q. What Can I Use for More Readers? If you need to design a reading program for an avid reader on your own, You've got lots of options! 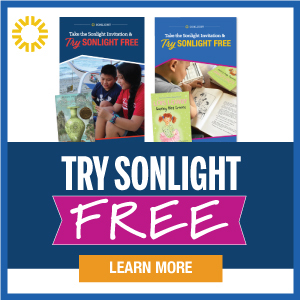 Try the Sonlight Summer Readers. 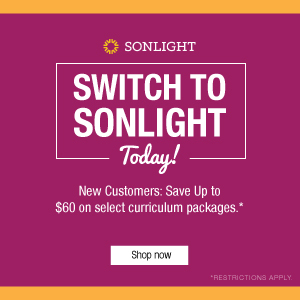 Look for retired Sonlight books (books from older Sonlight programs that are no longer used). We love to add in sequels and books by the same author. I also like to peruse other literature-based curricula and sprinkle in their books for readers, although I do have to warn that on several occasions, we have found books that I would consider less than appropriate for the age level of the child reading the book or behavior in the book that we would strongly disapprove of. Classics still make good reading material today. Used book sales and libraries will often provide hidden treasures. The goal is to get them reading, and once reading, to encourage them to read material that will interest them, help them learn, and keep them reading. You’ll find that most avid readers read everything: cereal boxes, street signs, the little brochures in the waiting room. They need less instruction on how to read and more guidance in finding great books. I learned early on that there was no way to keep my children in enough readers. 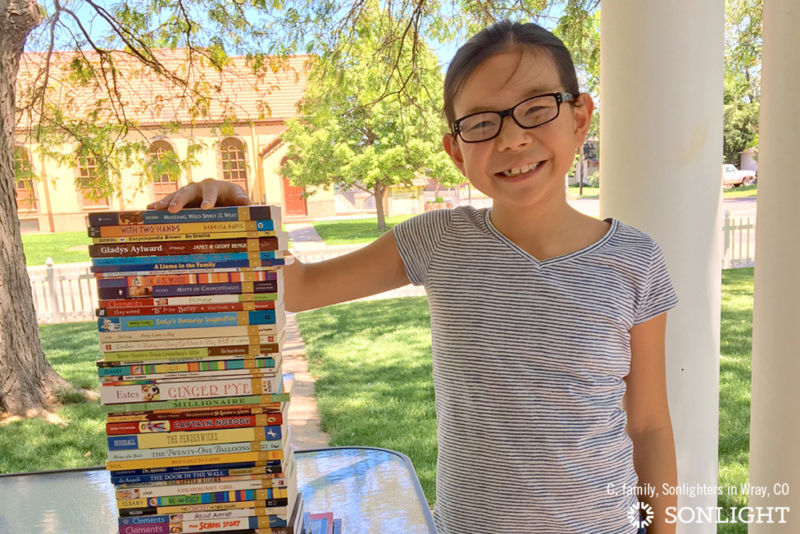 They would go through dozens of books a week from the library and read their entire weeks’ worth of reading in an hour or so on the first day of the week. However, I encouraged their reading by offering them a variety of good books so they were always learning something new and learning to appreciate high quality literature. 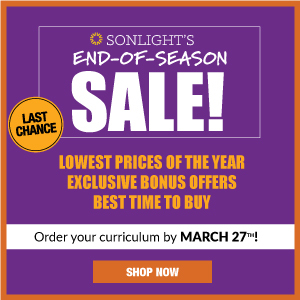 Sonlight will grow with your child, providing high quality books to read every year. While you might find yourself low on readers for a short while, there will be readers coming up that will help your child grown and stretch, even if they are already advanced. 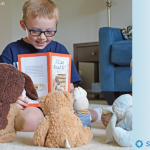 Children who are great readers will continue to be great readers with Sonlight.